Voronezh-DM radar station in Kaliningrad. Technical advances the Russian military’s air fleet and ground-based air defence systems have the Pentagon worried, with a top commander recently raising alarm bells. “Russia has closed the gap in capability. This is alarming,” said General Frank Gorenc, Commander of US Air Forces in Europe, in mid-September. Slovenia-born Gorenc said after Russia moved into Crimea in 2014, its air defence systems have begun probing territories beyond Poland. A new radar base in Kaliningrad covers a large part of Europe. With Russian air forces moving in to Crimea, the entire Mediterranean region has also been placed under surveillance and Russia is monitoring the region to raise its influence in West Asia, particularly in Syria. The US Air Force commanders alarm has caused irritation in the Russian Foreign Ministry. Foreign Minister Sergei Lavrov called Gorenc’s words provocative, and “artificially fomenting an atmosphere of hostility”. Gorenc’s statements were aimed at the budgetary exercise, because there is little parity in air aviation forces of the US and Russia. According to the Global Firepower Index (GFP) ratings agency, which analyzes the defence potential of various countries, the United States Air Force in 2015 had 13,892 military aircraft and 6,196 helicopters, while the Russian Air Force had 3,429 planes and 1,120 helicopters. “For the Pentagon, such statements are designed, first of all, to get more money from the US Congress. This is the traditional method used over the years for the purpose of getting additional funding for national security. Even though Russian military aviation poses no actual threat to the United States, and is only engaged in ensuring the security of its own borders and responding to NATO bases coming closer to the borders of Russia,” said Vladimir Timoshenko, retired colonel of Russian aerospace troops. In early 2015, Barack Obama cut the Pentagon’s budget from 636.6 to 502 billion dollars. The number of tactical air strike groups will be reduced, as well as naval aviation wings, from 9 to 4. Gorenc’s words about Russia’s air defence, however, are not far from the truth. 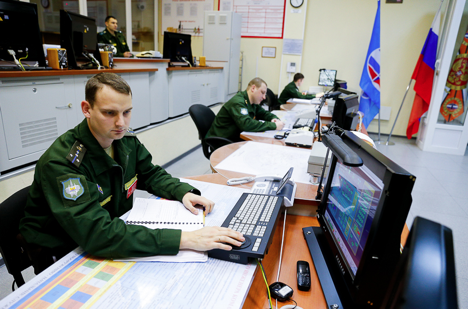 In Kaliningrad, the westernmost Russian territory, the Voronezh-DM Radar Station began operations in 2014. It has a scanning range of up to 6,000 kms over the horizon and 8,000 kms vertically, covering the near outer space. It can provide early warning about rockets launched from all NATO bases located not only in the former Warsaw Pact countries, but also Germany. Located at the entrance to Russia’s National Defence Control Centre is a giant electronic globe that displays the location of US aircraft carrier groups. “The quantity of American military bases around the world cannot in any way be compared with the Russian bases. The United States has more than 500, while Russia has only seven. Therefore, in quantitative terms, when it comes to airplanes, it is impossible for Russia to catch up with the United States,” said Timoshenko. The United States has bases in 130 countries. In Europe alone, the Americans have 205 full-fledged bases with complete infrastructure, where 250,000 soldiers are stationed. “However, in modern warfare, superiority is calculated not by the quantity of equipment, but its prospective quality. For example, to counter an enemy’s drones, one does not need to build the same number of unmanned machines or manned fighter jets. Just build an instrument to seize the UAV’s controls. In the army, the demand for soldiers-hackers will keep growing, not regular foot soldiers. When Sergei Shoigu became Defence Minister, he created ‘science squadrons,’ which will become the special smart forces of the future in Russia,” concluded Timoshenko.